Good things come to those who wait – so they say in certain Irish marketing departments anyway. Ironically, clubs in Ireland have been ringing the chairman’s phone off the hook this month looking to interview yours truly for their vacant hotseats. Why? Well… this young group of determined footballers keep going and we are now receiving the plaudits that their performances deserve. 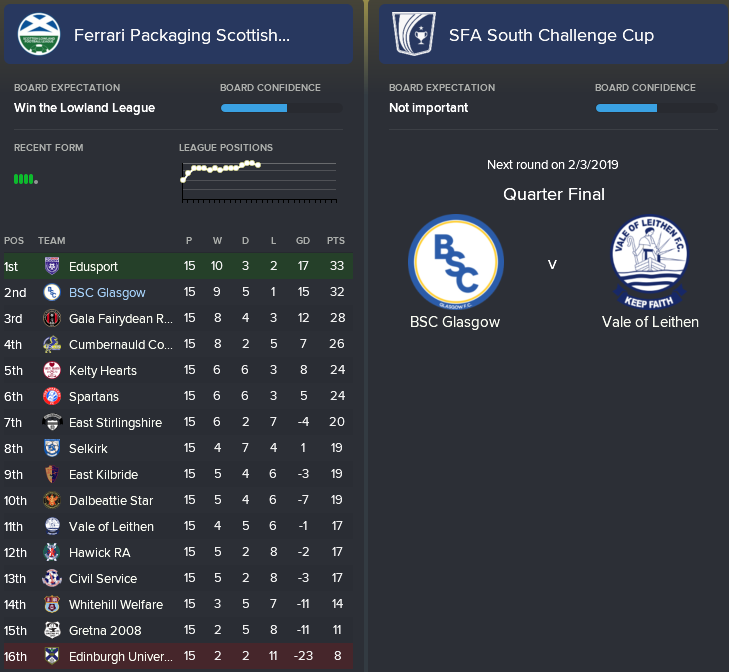 After our loanee Smith’s injury, I just wanted to make sure we still had a chance come the transfer window, where we could strengthen in preparation for an assault on the Lowland League. My squad have surpassed all expectations by continuing our excellent form, with only a couple of dropped points in two tough away trips. It’s been heartening to see goals shared around the team with Gray and Redpath beginning to help the cause when they’ve been most needed. It may not be a surprise to learn that I received the ‘Manager of the Month’ award for November, and look set to retain the accolade as December ends. In truth, the award belongs to my starting eleven which has played with increasing confidence and (dare I say it) swagger towards the tail end of this calendar year. BSC Glasgow had never gone unbeaten for this length of time in the past, meaning we’ve even written our names into the current history books over the last 9 league fixtures. Elsewhere at the Indodrill, however, the mood isn’t so merry at this festive time of year; Mr Prince has had quite enough of phone calls asking to speak with me in regards to available jobs, swatting off the likes of Finn Harps and most recently Linfield! I’ve reaffirmed my commitment to the cause, however, and as flattered as I am have no intention of walking away from a job half-finished. This recent run has given me the most enjoyment of my spell thus far and I’d be crazy to throw this opportunity away! In the dressing room, Jack ‘Smudger’ Smith’s return to the starting eleven has seen him retain his leadership role among the boys. We are beginning to manage some frustrated players on the fringes, notably Dale Baxter, but he and others have been reassured that each and every one of them is vital to challenging for the title over the next few months. Most of the guys are meshing well and spend a lot of their free time together, which has done wonders for morale. The backroom staff have already begun the pain-staking process of assessing possible January transfer and loan targets. We’ve given a few ex-SPFL youngsters a chance on trial for now, and if they impress will be in a strong position moving forward. The main area of focus is up front, where behind the classic pairing of Smudger and ‘Paolo’ Grehan there is a glaring lack of goalscoring ability. If Baxter continues to grumble I may also look to bring in someone in the middle of the park, while defensively we look to be set already as young Aaron Morrison continues to grow. Looking at the table, only Edusport Academy have been able to match our rampant form recently and look to be the main threat to our aspirations. We will have our opportunity to meet them soon, while an argument could still be made for any of the top 6 teams having a shot. As always, John O’Neil and I will stress the importance of concentrating on what we can influence; things elsewhere will shake out one way or another, but our fate is thankfully very much in our own hands. The word “playoff” has been banned from the stadium and training pitch until April comes, as anything could happen between now and then. 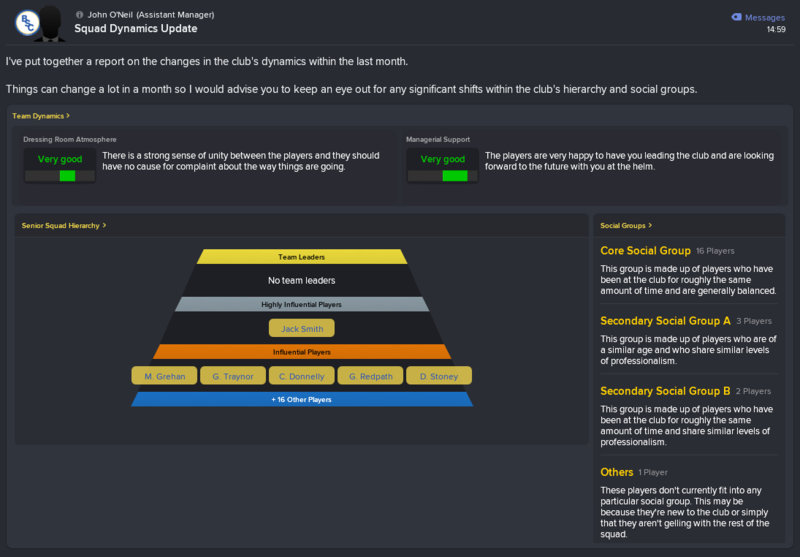 As Christmas arrives, I’ve given the players an extra couple of days off to reward them for a really solid first half of the season. Having now proven that we’re #NotHereToPlay, long may this mentality continue!